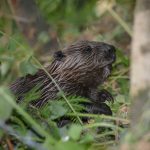 Our website address is: https://scottishwildbeavers.org.uk. We do not save personal data provided by you when you submit a form. The email address is required in case we need to reply to your email and we prefer to be able to respond using your name.